Use these databases, websites, and books to find trends and statistics about the gaming industry, including information about markets, and consumers. IBISWorld provides industry research reports and profiles for over 700 United States industries as well as a wide range of industries in China. Each report provides key statistics, market characteristics and segmentation, industry conditions, leading competitors, industry performance analysis and future outlook. Includes reports on Casino Hotels in the US; Lotteries & Native American Casinos in the US; Global Casinos & Online Gambling; Global Sports Betting & Lotteries; and Non-Hotel Casinos in the US. Offers yearly market research reports covering UK, Europe, US and International consumer markets for products, markets and demographics. Users are required to set up a personal profile with a log in and password. Analysis includes market sizes and forecasts, market trends, market segmentation, competitive context, broken down segment performances, retail channels, consumer demographics and survey results, leading companies, brand share, marketing strategies, and more. Relevant reports include Casino and Casino-style Gambling, Casinos & Bingo; Casinos (including Online), Casino Hotels International, and Online and Interactive Gambling. The largest repository of English-language materials on gambling, this is an unparalleled repository of books, journals, and primary materials for gaming research. This includes statistics on the state level for casinos and gambling across the US, press-releases, news, white papers, and trend reports. Comprehensive resource on the worldwide lottery industry. Includes compilation of data on North American lotteries, including startup history, guide to product mix, government profits earmarking, lotto matrices, worldwide lotto matrices, top lotto jackpots and video lottery terminal guide. Features profiles on U.S., Canadian, and Australasian lotteries. Contains chapters on worldwide lottery sales; fiscal sales, profit and expense analysis; the retailer network; ad expenditures; historical analysis; contractor survey; and calendar year U.S. lotteries’ weekly sales by game. 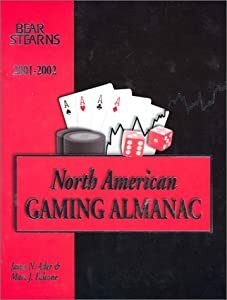 North American Gaming Almanac by Bear, Stearns & Co. Provides in-depth company profiles, revenue summaries and projections, economic outlooks, and region-by-region demographic breakdowns). Business Source Complete provides full text for scholarly business journals and other sources, including full text for more than 1,800 peer-reviewed business publications. Coverage includes virtually all subject areas related to business. It also includes industry and country reports from Euromonitor and company and industry reports from Datamonitor. Search for articles about gaming trends internationally or in specific geographic regions and/or casinos.